Here’s a Thanksgiving recipe my family and I have made for years. 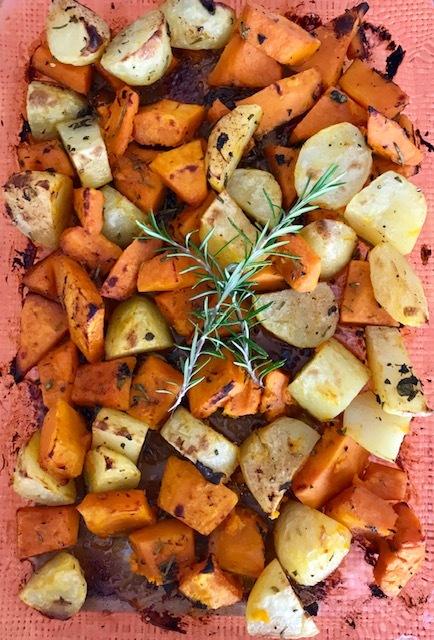 The potatoes and yams get the “Italian” from the rosemary, garlic and olive oil. You mix the ingredients together and the oven does the rest! Happy Turkey Day! 2. Drain potatoes and yams; dry them with paper towels. 3. On a chopping board, cut potatoes and yams into 2-inch chunks; immediately transfer them to a large 16 x 10-inch Pyrex® baking dish or rectangular, disposable aluminum baking pan. 4. Add the olive oil, chopped rosemary leaves, garlic, salt & black pepper; toss together until all ingredients are uniform. 5. Place Pyrex® baking dish or aluminum baking pan with potatoes & yams on a rack set in center of oven. 6. Roast potatoes and yams, uncovered, for 30 minutes. After 30 minutes, check doneness by tasting a potato (potatoes will take a few minutes longer to bake than the yams). If potato is still a little firm, roast for an additional 5 to 10 minutes. 7. Serve immediately as a side to turkey, meat or seafood.